Sage (Salvia officinalis) is a member of the mint family. It is a savory herb best known for adding sweet, earthy flavor to holiday stuffings. However, its uses aren't just culinary. A cup of sage tea offers medicinal benefits, as well. Make sage from fresh or dried sage leaves. It is easy to grow in your backyard, or you may purchase it at most natural health stores. Fresh sage should be bright greenish-silver with no spots. Wrap fresh sage in a damp paper towel and store it in a plastic bag in the refrigerator. It should last a week or so. Dried sage lasts several months stored in an air-tight container in a dark place. Choose organic varieties of fresh or dried sage whenever possible. Pour the tea into a mug. Not everyone likes sage tea's strong, somewhat bitter/astringent flavor. To make it more palatable, add honey (or other natural sweetener), lemon slices, or orange slices. You may also add sage leaves to other tea blends, such as peppermint or lemon balm. You may enjoy this tea iced; simply add ice cubes to warm sage tea. If you have an infusion pitcher, add fresh sage into the infusion container and fill the pitcher with water, iced tea, or an herbal fruit tea such as blackberry. Some research supports what natural healers have believed for ages. A 2011 clinical trial showed fresh sage leaves significantly reduced hot flashes in menopausal women. The treatment was well-tolerated. In a 2006 study, the use of a dried sage leaf preparation resulted in a memory and mood boost in healthy, young people. Researchers believe sage is a natural cholinesterase inhibitor. According to the University of Florida College of Public Health & Health Professions, cholinesterase inhibitors are enzymes that help prevent the breakdown of acetylcholine in the brain. Acetylcholine is a neurotransmitter that plays a key role in memory function. Synthetic cholinesterase inhibitors such as Aricept are used to treat mild to moderate Alzheimer's disease and dementia. Results from a small 2008 study showed healthy older people given sage extract experienced significantly improved memory compared to people given placebo. 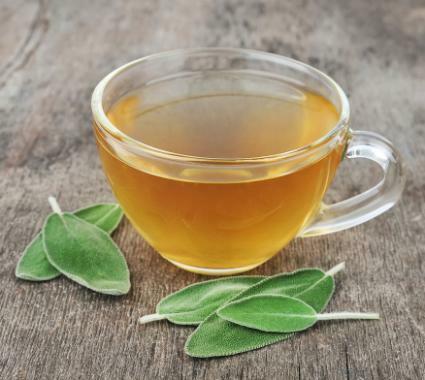 Results of a 2006 animal study suggest sage tea may lower blood sugar levels in people with type 2 diabetes in a similar way as the diabetic drug metformin. A 2008 study supports sage's disinfectant benefits. The study showed essential oil from sage grown in Tunisia is effective against some bacteria, molds, and fungi. According to an article published in the Journal of Traditional and Complementary Medicine, some species of sage may help prevent or cure several diseases and conditions, such as cancer, heart disease, high cholesterol, depression, obesity, lupus, and autism. The article indicates more study on sage's long-term safety and efficacy is needed, but research to date is encouraging. In some cases, ingestion of sage tea may be contraindicated. It's best to consult your doctor or natural health practitioner before using sage tea if you have a medical condition such as diabetes, epilepsy, or high blood pressure. Avoid sage if you're pregnant or breastfeeding. According to WebMD, sage contains thujone, a chemical which may cause menstruation or reduce milk supply. Sage may interact with diabetes drugs, seizure drugs, and sedatives. Sage tea may not be the tastiest herbal brew, but it's one of the most valuable. Since sage is easy to grow and find, there's no excuse for not incorporating it into your natural remedy medicine chest.